I have probably seen the leaves of sweet potatoes (Ipomoea batatas) in various Farmers’ Markets many times before, but was formally introduced to them by a fascinating (and quite challenging to shop for) book called Cooking with Asian Leaves. The book provides detailed descriptions of thirty herbs and leaves used in Asian cooking, and two recipes for each. There are many that you would expect–curry leaves, shiso, chrysanthemum, Thai basil–and many that are unheard of outside of Asia (or expatriate communities) like boxthorn leaves, agathi leaves (a.k.a. West Indian pea tree, white spinach), noni leaves (a.k.a. morinda, Indian mulberry), and ponnangani (a.k.a. sessile joyweed). I imagine that most of the leaves are available somewhere in the Bay Area, but have thus far not gone on a systematic leaf quest. Like spinach, chard and other greens, sweet potatoes leaves are highly versatile. Cooking with Asian Leaves has two recipes: sweet potato leaves in a coconut milk sauce, and stir-fried sweet potato leaves. Since it was still close to my Eat Local month, I used the second one as my inspiration. I found the leaves to be quite tasty: tender, a nicely balanced flavor, not even a hint of bitterness, and none of that strange astringency that greens like spinach and chard possess. Fill a pot with water and put it on the stove over high heat. The pot should be large enough to hold the leaves, and there should be enough water to cover the leaves. Strip the leaves from the branches. The thin stems that attach the leaves to the branch are tender enough to eat, so there is no need to remove only the leaves. Wash and drain the leaves. Mince 1-2 cloves of garlic. Chop the chilies fine, and combine with the garlic. In a large skillet or wok, heat some vegetable oil over high heat. When it is hot, add the garlic and chilies. Cook for 30 seconds, stirring often. Add the greens, then stir-fry the mixture until the greens are tender, about 2 or 3 minutes. Add salt, pepper, soy sauce, or other flavorings to taste. Note: Separating the leaves from stems for some bunches of leaves can be a tedious chore, but with this particular batch of sweet potato leaves, the leaves were attached to the tough branch by a long stem, and I was able to quickly strip them using a pair of scissors. We eat quite a lot of sweet potato leaves in our part of the world. The chinese will stir fry it while the Malays will cook it in creamy curry – both taste great. What a cool series of posts. I usually just go for the ‘spring mix’, but next time I’m at a farmer’s market I’ll have to check out something a little different. Where did you pick these up, if you don’t mind me asking (I also live in Berkeley)? boo_licious – thanks for visiting. I plan on trying s.p. leaves in a coconut curry one of these days. I’ve been seeing this lately and the farmer’s markets and wondering what to do with it – thanks! I make the version with coconut milk with any green at hand – usually collard or chard. I love potato leaves stir fried with a little garlic and yellow bean paste. My Thai mother used to make them for us at least once a week when we were children. I am glad I live close enough to a huge farmer’s market here in Atlanta GA so I can always find them. YUM! My wife saw a clip on tv around ten years ago in which a woman gave 4oz of sweet potato greens with each to 15 men whose cholesterol was over 300 each. Their numbers dropped into the 100’s, but i do not remember how long it took, no more than three months as I recall. We never saw it again nor can locate the study on the internet. 14Apr08 According to LSU professors in Food Science and Horticulture, sweet potato leaves are high in lutein, protective against age-related macular degeneration. Recommended daily 6 mg lutein, which can be obtained from about 1 oz of kale or 2 ozs of spinach (fresh raw leaves). Probably 1 oz servings of sp leaves would also do the trick. Marigold petals are fed to hens to deepen the yolk color and add lutein. SP leaves would do the same; my hens strip any vines that grow their way. A friend grows sweet potato leaves and gave me some clippings, and they grow rapidly. They are a great container plant. I put them in boiling water for about 3 minutes, drain them , then put in a hot wok with oil and garlic. When the stems are tender, I add soy sauce and a little chili bean sauce and enough water to dissolve the bean sauce. About 1/4 c. and Cook until liquid is reduced by half. They are so good for you, and me. kathy — I hadn’t thought about growing sweet potatoes for the leaves, but it sounds like a great idea. Thanks for the tip. We make a summer juice out of them by boiling and adding raw sugar. It is delicious cold, almost tastes like freshly made soy milk. Helps us fight dengue fever and stuff. I was recently told by one of my friends that Sweet potato leaf tea could help with my anemia (low iron in the blood). Has anyone else ever heard of this? I would also be very interested to know more about the cholesterol study mentioned above. I grow a white variety of sweet potato in our apartment as edible houseplants- they’re super easy to propogate and raise and are fast growers. We get a meal off of our houseplants every few weeks in the winter- nice when you can hardly find good greens! Chaya is also a good plant for this kind of thing- but boil it, don’t just steam it or stir fry it. 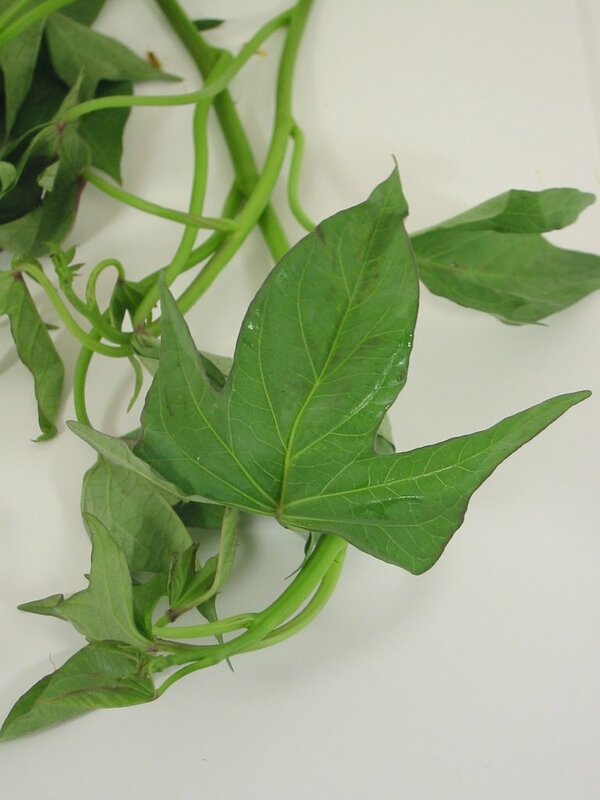 I usually just steam the sp leaves- they’re very mild, with good flavor, and have great texture! its also very popular in west africa. Doctors recommend potato leave when you are ill as it makes your blood stronger. Tried your receipt, added a bit of fresh coconut water.was very nice indeed. I have never had this before. I just bought some this evening and can’t wait to try them. This is wonderful. I live in SW Florida and have been growing boniato. Now I have something to do with the leaves. Bea, I'm curious, what's the ratio of water to leaves for the drink you make? Don't you loose a lot of nutrition by boiling the leaves and also by throwing away the stems? Does one harvests the leaves as the sweet potatoe continues to grow? Hi! I found this post looking for recipes for sweet potato leaves after finding out from a different blogger's post where I found out they are edible. I wonder if I could just add some leaves to vegetable soup. Sue — I don't see why the leaves couldn't be added to soup. However, you might want to blanch them in boiling water for a minute to remove any excess sap from the leaves. That's the advice in "Cooking with Asian Leaves." My parent's grow sp leaves in their backyard as this is very hard to find in Australia. It is very easy to grow and it taste great in stir fries…..
Hi Marc … landed here searching for SP leaves . they are growing in my garden and i am so glad i found a great yummy greens for my stir fries. I have linked this post to my blog , hope you are okay with it. Had a SP Leaf & Apple smoothie for breakfast. Raw is great. I'm interested in the SP leaves and apple smoothie that "anonymous" mentioned. What went in it? I'm hoping it might be a good nutritional drink for my kids. Anything to get them to eat more veggies. can you eat the leaves of the sweet potatoe raw…I have seen people make green smoothies using the raw leaves, plus yummies like bananas and such. I thought the leaves had white sap which is some plants is poisonous. Mission Hunan on 16th Street near Mission in SF served sweet potato greens with garlic sauce – delicious! Many Asian restaurants offer a variety of dishes to their compatriots (who know to ask for them) that do not appear on the English menu. They are missing out on business from foodies and the just plain curious. sweet potato vines edible? I have a huge container growing at my home. My neighbor has a mountain of the light green sp leaves for ornamental decoration. Can we eat those? Which ones are poisonous? I can't find anything else on the net. Thanks for your blog. I ate sw leaves last summer (the dark green ones) sauted with a little onion and fresh garlic in olive oil. We loved it! I bought some sweet potato leaves and decided to stir fry them the way my mother used to. Unfortunately for me, I rarely spent time with my mother in the kitchen when I was back home. I remember how she used to soak greens in salt water before cooking them, but then again I was terribly unsure. I stumbled upon your blog which was very informative about the preparation (blanching the leaves before stir-frying), and I did as was written. The result was a delicious stir fry, and I usually put up successful attempts at cooking up on my blog. Do you mind if I post a link to your site to acknowledge my source? ps/ I am really, only a small time blogger and do it out of pure interest in blogging as well as cooking. nothing more. **I am referring to the preparation method with regard to blanching of the leaves, but not the recipe itself. Love your blog and stumbled upon it whilst researching 'eating Greater Yam leaves' (Dioscorea alata). Do you know if these can be eaten as well? They make a simple tasty salad…. (often the best kind). Blanch the leaves briefly, with stems attached,then stop further cooking under cold water. Add chopped tomatoes and onions, drizel some fish sauce and a teaspoon or two of lime/lemon juice. Toss that all together and enjoy the experience.The great cuisines of Asia are never wrong. Been eating "Kamote" leaves (Sweet Potato) since forever. Probably great that I live in Ca's farmlands. I've never been told the sap is poisonous. I just wash and put them into anything. Usually, blanched then drained, with some fresh tomatoes, chopped green onions and "bagoong" (fermented fish sauce). Yummy. with rice. BUt it's just like spinach. I haven't heard anything about the ornamentals. I should think the leaves are edible as well. The only thing I'd be wary about is that because the color isn't dark green, the nutrients may not be as good. Esp the iron content. just me or does it look as if like some of these responses appear like left by brain dead visitors?